I’m happy to welcome author Sylvia Spruck Wrigley as a guest of Bready or Not! 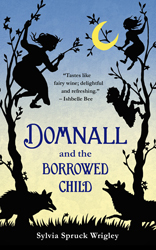 Her novella Domnall and the Borrowed Child was published by Tor.com just this Tuesday, and it’s all about FAIRIES. A unique approach to fairies, too–you get to learn about changelings, from their perspective! 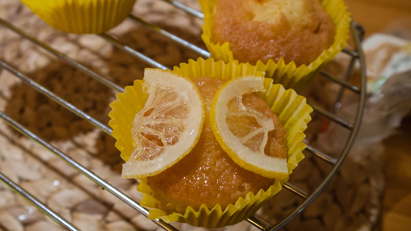 Quite appropriately, Sylvia is here to share a very British recipe for Lemon Fairy Cakes. The best and bravest faeries fell in the war against the Sluagh, and now the Council is packed with idiots and cowards. Domnall is old, aching, and as cranky as they come, but as much as he’d like to retire, he’s the best scout the Sithein court has left. When a fae child falls deathly ill, Domnall knows he’s the only one who can get her the medicine she needs: Mother’s milk. The old scout will face cunning humans, hungry wolves, and uncooperative sheep, to say nothing of his fellow fae! These days in Britain you are more likely to see a cupcake than a fairy cake. Cupcakes are modern, decadent, bold. 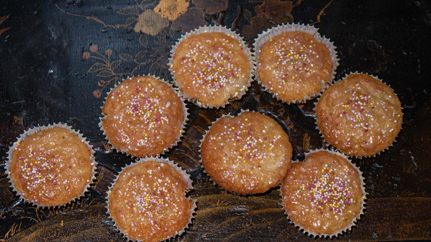 Fairy cakes are old-fashioned, relics of children’s parties from years gone by. They are smaller than cupcakes and, to my eye, a little more refined. A fairy cake is easy to recognise because it is never, ever topped with thick swodges of buttercream but instead gets a quick white glaze made with icing sugar (powdered) and water. Very special cakes get “royal icing” made with egg whites. Although any type of cake can be made into a cupcake, a fairy cake is based on Victoria sponge. 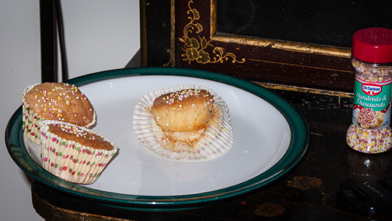 These dainty cakes (just the right size for a fairy) are still seen as more appropriate for children, as they are smaller and with less sugar, whereas cupcakes are popular at weddings and hen nights. The original fairy cakes (cakes just the right size for a fairy) are first referenced in the 1700s and were baked in ramekins or individual pottery cups. 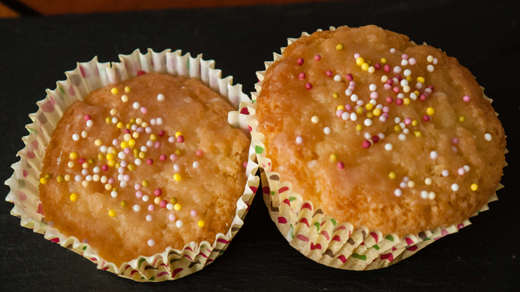 Although many people now make fairy cakes in muffin tins, you should take care to only fill the cups halfway so that they don’t turn out too large and get mistaken for a poorly frosted cupcake! Now you’d think it’d be easy to make a British recipe in a British kitchen. Further, you’d think it would be easy to convert. Unfortunately, there are some issues which I feel compelled to share with you. I should reassure you first, however, that this is a very simple recipe, commonly the first treat that children in England learn to bake. So don’t take my notes all too seriously – just follow the recipe and I’m sure you’ll be fine. I modified the recipe slightly to convert it to American measurements. The recipe works with imperial, metric and US measures but don’t mix and match between them. The butter/sugar/flour amounts are slightly higher in the US version but no one complained (well, not about the cake, anyway). I’ve simply said to bake these at 180°C/350°F, just like the majority of cakes baked around the world. However, that’s not the way recipes work in the UK. Pre-heat your oven to 200°C or 180°C if it is a fan-assisted oven or gas mark 6 if you haven’t upgraded your oven since 1962. So if you bake using an exciting oven or even (god help you) an Aga, then I’m afraid you are on your own, but I suspect you are probably used to it. The recipe makes twelve fairy cakes but that’s assuming a British bun tin. You can make these with muffin tins just fine, just be sure not to overfill your cases. Standard cupcake cases should only be filled up to the halfway mark. If you make these cupcake sized, you’ll only get nine. My first batch, the control group made with British imperial measures, I thought it would be nice to add fairy wings. I thinly sliced some lemons and candied them in the oven at low heat, then cut them in half and stuck them on with the lemon glaze. Every single person ripped the wings off and discreetly abandoned them somewhere. Apparently, that was not an appropriate decoration for a fairy cake. Who knew? This didn’t seem like a requirement of fairy cakes, but I’m not British and I’m aware that sometimes I can miss nuances. 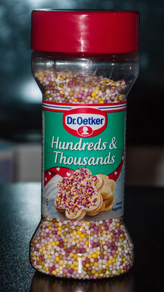 So I purchased sprinkles which actually said hundreds and thousands on the label and did the decorating again. “What have you done? This is more like tens and hundreds,” muttered my boyfriend. I gave the very last fairy cake to the security guard who patrols the marina flats. I barely know him but it’s a long cold shift in November and I wasn’t speaking to anyone in the family by then. So learn from my mistakes. Don’t bake things for the British. Pre-heat your fan-assisted oven to180°C/350°F and line your muffin tin with fairy-cake or cupcake cases. Cream the butter and the sugar at high speed for three minutes or more. Keep the speed on high and add the two eggs one at a time. 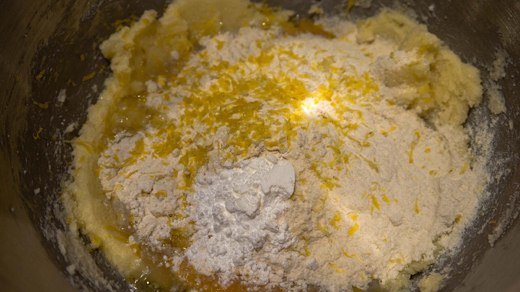 Once well mixed in, add the flour, the baking powder and the lemon zest. Fold the dry ingredients into the batter until blended. Drop a large spoonful of batter into each cake case – if using cupcake-sized cases, only fill to halfway. Bake in the pre-heated oven for about 15 minutes, until the cakes have risen and are golden-brown. While the cakes are baking, mix the powdered sugar with the lemon juice so that you have a thick but still spreadable glaze. Brush the cakes with the lemon glaze while still warm so that the lemon syrup will melt into the cake. Then remove them from the muffin tin. After the cakes have cooled, brush the tops again with the glaze and sprinkle generously with rainbow sprinkles. Sylvia Spruck Wrigley was born in Germany and spent her childhood in Los Angeles. She emigrated to Scotland in 1990, guiding German tourists around the Trossachs while she searched for the supernatural. She now splits her time between South Wales and Andalucia where she writes about plane crashes and faeries, which have more in common than most people might imagine. Her short stories have been translated into over a dozen languages.